axisVFX, the visual effects arm of Axis Studios and creator of high-end CG imagery for television and film projects, has delivered 1,350 shots over the course of 13 months on Aardman Animations’ latest stop motion epic Early Man. The work included the film’s dramatic prologue, epic stadium shots, the moody badlands, lava, fire and water FX. Set at the dawn of time, Early Man tells the story of courageous caveman hero Dug (Eddie Redmayne) and his best friend Hognob as they unite their tribe against the mighty villain Lord Nooth (Tom Hiddleston)to save their home, going head-to- head in a winner-takes- all football match. constructed environments in its work, seamlessly integrating Aardman’s CG and puppet worlds. Axis Studios’ Glasgow HQ also contributed, providing complementary render support and simulation expertise. Adventure with Scientists. With both studios based in Bristol, they enjoyed a constant creative dialogue on Early Man, meeting weekly to ensure the VFX and stop motion elements worked seamlessly as one. axisVFX contributed to three main stadium sequences that comprised approximately 20 minutes of Early Man’s run time. There were several football pitch sets at Aardman’s studio surrounded by green screen, and a scale model of the whole village, stadium and surrounding cliffs. axisVFX was tasked with digitally extending the stadiums and creating a reactive digital crowd containing 20,000 spectators – a visual that would have required an inordinate amount of time to achieve using stop motion. 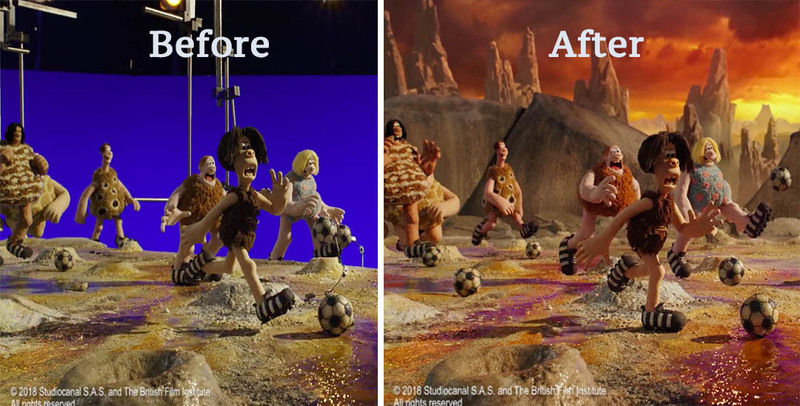 Aardman created 40 digital characters – each with 25 animation variations – which axisVFX then used to populate the stadium stands. Live action video reference was provided by director Nick Park to drive the animation of the crowd, ensuring axisVFX matched his vision. axisVFX also created virtual grass and defined the atmosphere of each sequence, building layers of smoke, fog and lighting to contribute to the stadium’s sense of scale, and ensured consistency across the stadium sequences, matching colour, atmosphere and lighting across shots. Early Man’s prologue takes viewers on a journey through the dinosaurs’ extinction event, which axisVFX augmented with CG. The sequence commences with a CG shot of the moon and planet Earth circa 50,000,000 B.C. Shots of dinosaurs are then witnessed against the background of a descending meteor. axisVFX created the meteor and its tail and the resulting cosmic explosion. Post-meteor, axisVFX artists added CG fire and smoke to the Aardman set. In other sequences axisVFX created bubbling lava across which characters hop on floating coals and geysers that shoot CG water into the air. The axisVFX team ensured that these simulations had a rhythm and movement in sync with the film’s stop motion feel.